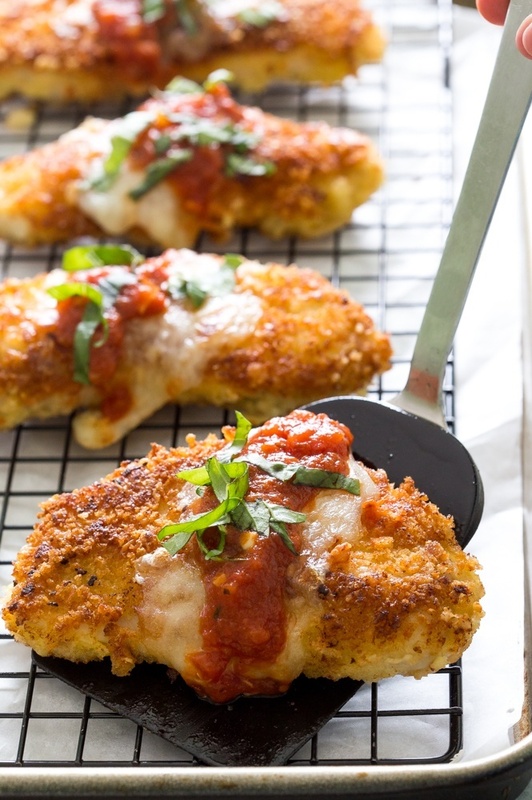 This super crispy recipe of chicken tenders can made with or without the tomato sauce and mozzarella cheese. When are little chefs from TRFA prepare this recipes, we know that there will be NO LEFTOVERS! Panko Breaded chicken tenders smothered with tomato sauce and mozzarella cheese. Preheat oven to 375 degrees. Fill one mixing bowl with the flour, another with the whisked eggs, and a third with the panko, Parmesan, parsley, salt and pepper. Stir to evenly combine the panko mixture. Dredge each chicken piece in the flour, until evenly coated, then dip in the egg mixture, and finally in the panko mixture, pressing the panko gently against the chicken to thoroughly coat. Place the chicken on an oven-safe rack on a sheet pan, and bake for 20-30 minutes until golden brown and cooked through. Smaller tenders will cook more quickly. Serve warm with your favorite dipping sauce. Pour 1/2 of the spaghetti sauce into a 7×11 inch baking dish. Place chicken over sauce, and cover with remaining sauce. Sprinkle mozzarella on top and return to the preheated oven for 10-15 minutes until cheese is completely melted. Previous Post Simple Reasons Why You Should Add Beets To Your Diet Next Post Can I bring my own refreshments and/or beverages of choice?